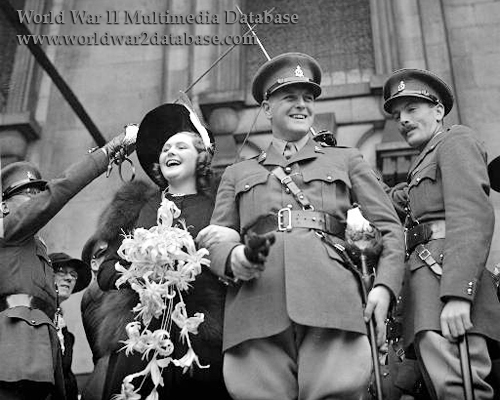 Pamela Digby, later Pamela Harriman (March 20, 1920 - February 5, 1997) and Randolph Churchill (May 28, 1911 – June 6, 1968) leave Saint John's Church in London's Smith Square on the day of their marriage on October 4, 1939. Churchill is accompanied by members of the 4th Queen's Own Hussars, which was also his father Winston Churchill's regiment. The 4th Hussars suffered serious casualties in the fighting for Crete, North Africa and Italy, eventually joining with the 8th Hussars because so many officers and men were dead, wounded, missing or prisoner. Churchill himself transferred the Special Air Service as a commando, fighting with SAS founder David Stirling in North Africa. Later he narrowly escaped death or capture in Yugoslavia when the Germans attempted to capture Josef Tito during Operation Operation Rösselsprung. Pamela Digby had affairs during the war with Edward R. Murrow and Averell Harriman, who later became her third husband. The public wedding was attended by the Prime Minister, the groom's father; hordes of well-wishers were present outside the church. For many, the wedding had a sense of foreboding, taking place during the Phoney War. Many of the guests and attendees would be dead or maimed five years later, and there was a sense that this was the last celebration before the war. Saint John's church was destroyed in the Blitz a year later. Digby and Churchill divorced in December 1945; she claimed Churchill had abandoned the marriage in 1942.